Yeah, this place is good. But, it comes with a hefty price tag. You can get Vietnamese food equally this great and pay half the price outside of the city, SF’s Saigon Sandwich even. I went to school in San Jose, and I’m use to $5 bowls of pho and $3.50 Vietnamese sandwiches. Boy, was I spoiled. Because of convenience, I am now paying $7.50 for spring rolls and $8.50 for a Vietnamese sandwich. Out The Door is the take-out version of the very famous, Slanted Door. I’ve never had the opportunity to dine here, but OTD is a good, safe introduction to Vietnamese food. What sets this place apart from other Vietnamese restaurants are their unique menu options. In addition to the usual pho, sandwiches and vermicelli bowls, they have more Chinese-inspired dishes like porridge and buns. This place gets super busy, so come early if you’re in a rush. Spring rolls – I love these spring rolls, especially because there are no bean sprouts. The rolls also have the best balance of ingredients – large pieces of cooked shrimp, tons of noodles, few shreds of mint leaves and a chewy wrapper. I also think there’s some kind of sauce in here, but I can’t pinpoint what it is. Best part of the dish is the peanut sauce. It needs a little kick, but it’s still yummy. 5-spice chicken sandwich – The chicken is flavorful, juicy and perfectly cooked. The sandwich is loaded with pickled veggies and the special white sauce that’s traditionally in other Vietnamese sandwiches. I also love that they have little containers of jalapenos so I can add as many as I want in my sandwich. I love this place, partly because there’s barely any good Vietnamese options in this area other than Sai’s (but it’s a hike). But, I’m going to give OTD 3 clubs just because of the price. I’m so glad I made it to the SF Street Food Fest in the Mission on Aug 21st. Here I was able to try most of every food truck in the Bay Area I’ve always wanted to try such as Lumpia Cart, Curry Up Now and Hapa Ramen. The one-day event was über packed and vendors were selling out left and right. Each vendor (mix of food trucks, restaurant stands, and suppliers) offered 3 items – a small bite, bigger bite and a drink. I pre-purchased a $75 pass with 3 other friends which allotted us $75 worth of food and 2 free drinks. If I had known I could’ve purchased items a la carte the day of, I totally would’ve gone that route as it was painful to eat that much food. I was pretty underwhelmed with the event as a whole. There was no single item I absolutely fell in love with – a few good finds, but a lot of flops. I’m wondering if it was because the food carts were not use to making food in such large batches. I came really early so I didn’t hit really long lines, but when I left the event got really crowded. A few friends that also went to the event complained that they spent most of their time in lines and a lot of vendors sold out of their popular items. Click below to read the review on every cart I tried. K was just telling me the other day, “Someone need to make a Peking duck taco.” Well, at Kung Fu Tacos, you can get just that. An old college friend (and fellow foodie) came to visit me at lunch one day during work and decided to try the famous KFT. This is an order, grab your food and eat at your desk kind of place. You’d have to work in the area to eat here since there’s no where you can park or sit. The line was short and service was quick. It took about 2 min til we got our food. Their menu consists of only 5 different kinds of tacos, but the specialty tacos ($3 each) is where the party’s at. You’d definitely need at least 3 to get full. I actually had lunch before I came here, so I was only able to try the duck taco and a dessert. 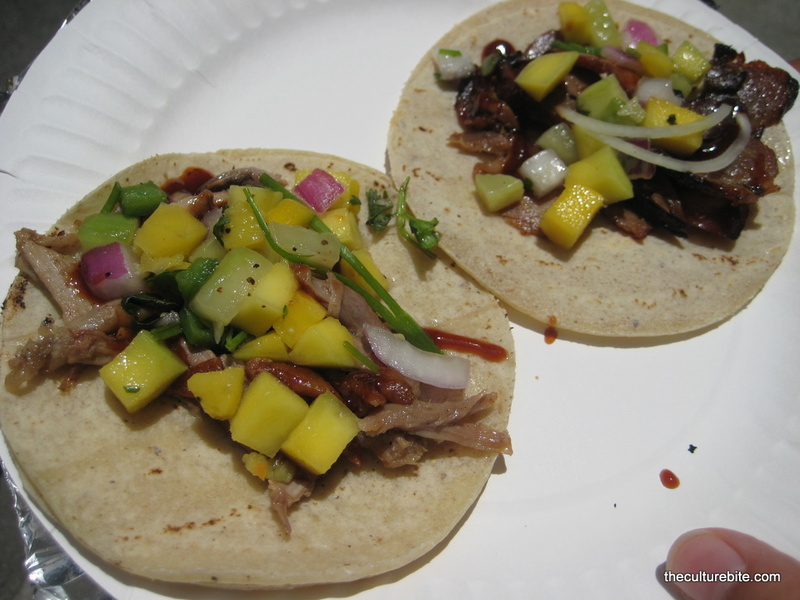 Roast Duck taco – These are street-style tacos, so they’re about the size of my hand which is pretty tiny. This taco consisted of roast duck, Hoisin sauce, mango salsa and green onions all on top of a chewy corn tortilla. The mixture of flavors are great. I would’ve been fine with just the duck and sauce, but the salsa really brings it up a notch. The sweet and tangy salsa adds a punch to the taco both texturally and taste-wise. Dulce de Leche Banana Empanada – Unfortunately, this sounds a lot better than it tastes. I was looking forward to a buttery, crispy shell oozing with mushed bananas and caramel on the inside. To my dismay, I found mostly crust and a super thin layer of caramel sauce with a hint of banana flavor. Super disappointing. Kung Fu Tacos is one of the more famous food trucks in San Francisco, and by the taste of their tacos, I can see why. I’d love to come back again to try their Wu Shu Char Sui taco. I’m soooo going to this. SF is a foodie haven filled with street food vendors. From tacos to Korean tacos to creme brulée carts to Belgian waffle carts, we have a cart for everything.